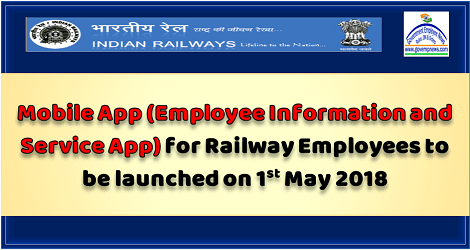 Sub: Launch of Employee Information and Service App on May Day i.e. 01.05.2018 by all Railways. Hon’ble MR has desired that Railways should develop an Employee Information and Service App which will be launched centrally on May Day to cater to requirement of employees. In this regard, meeting of all Nodal officers from Railways was held in Railway Board on 12.03.2018 and it was decided that all Railways shall start and complete the basic ground work such as scanning of Service Record, APAR, Seniority list, etc by 15th April 2018 as the above documents/information may be required as feeder data for the Mobile App. Attention is also invited to Board’s letter No. 2017/Transf.Cell/Go Digital dated 04.01.2018 issued by ED/Transformation Cell, Railway Board (Copy attached). Vide aforesaid letter, the decision of Railway Board (CRB) for implementation of following initiatives of Delhi Division was conveyed to all Indian Railways. As the Mobile App for employees is to be launched on May Day. Zonal Railways are advised to immediately get in touch with Ms. Wormila Jasmine Keishing, Sr. DPO-II/Delhi Division (Mobile-9717631601) for working out linkages and uploading required data using User ID and Password. Delhi Division/NR is the Nodal Division in this regard.